It would be interesting to hear from the authors of the new “scientific”and objective study. Earlier today, EID highlighted seven facts to know about a new study claiming to show “evidence” that fracking is responsible for greater incidences of low birth weights, most of which call the study’s topline finding into question. Fact No. 8 emerged soon after our blog post went live, and it reveals a probable motive for the researchers arriving at that inflammatory topline finding despite numerous limitations and contradictory data. Turns out one of the report’s major funders — the MacArthur Foundation — has provided Earthworks and Natural Resources Defense Council $10 million since 1978. Given that sort of financial commitment to a pair of groups that are actively seeking to ban fracking, it’s hard to imagine the MacArthur Foundation funded this study with hopes it would yield an objective, science-based conclusion clearing fracking. ProPublica, of course, has done numerous anti-fossil fuel stories, which can probably be traced to the fact that it has received tens of thousands of dollars from the Rockefeller Family Foundation over the years. But the authors admit that the study was only exploring “potential” pollution, not “actual exposure,” and even said that such pathways are “not known with certainty.” Instead, the authors relied on a simple spatial correlation to suggest that the closer mothers live to production sites, the more likely they are to have babies with lower birth weights. Yet their own data contradict that claim as well: according to the study, there was a greater incidence of low birth weights among individuals living farther away (3 km) from a well site than those living closer (2 km). These aren’t small caveats. They’re flaws and limitations that directly contradict the inflammatory press release that the authors strategically circulated ahead of the study’s publication. Here are six key facts to know about this study. The study purports to link proximity to well sites with lower birth weights. But as the following graphic from the third page of the study illustrates, the researchers found mothers who live 3 kilometers (km) away from oil and natural gas production sites are actually more likely to have babies with low birth weights than those who live 2 km away. The chart clearly shows that the risk for low birth weight drops significantly in the 2 km bar (second from the left) and then sharply rises in the 3 km bar. 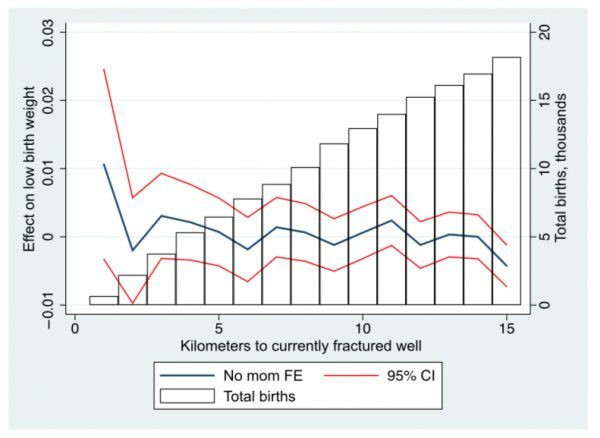 There is no explanation as to why the data show mothers farther away from fracking sites in the 3 km distance category have a higher risk than those who are closer. Interestingly, had the researchers used miles rather than kilometers, much of the data finding lower risk would have been included in a 1-mile-and-closer to fracking sites grouping and skewed the risk level down significantly. In other words, the odd choice of using kilometers is the only way the researchers can show a high result for mothers who reside near oil and gas development. But the researchers neglect to mention that even the authors of that study — headed by Gasland star and noted fracking opponent Theo Colborn — were forced to concede that “the chemicals reported in this exploratory study cannot, however, be causally connected to natural gas operations.” Further, many of the measurements that they made showed emissions levels that were not high enough to trigger public health concerns. EID’s recent Compendium of Studies Demonstrating the Safety and Health Benefits of Fracking details no fewer than five studies based on actual air measurements in Pennsylvania have found production emissions are protective of public health (one of these studies was conducted near a school). 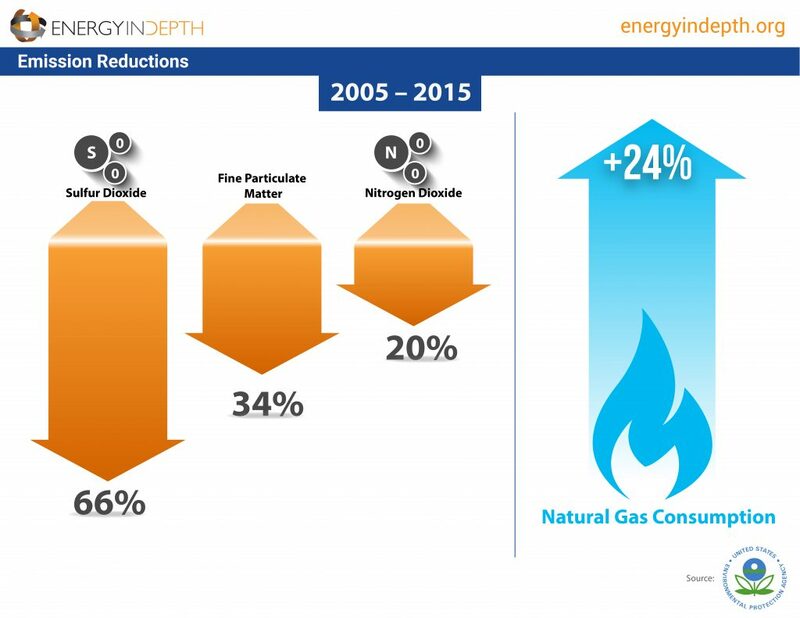 The Pennsylvania Department of Environmental Protection has also found that thanks to natural gas, emissions have been reduced by over 500 million tons. CDPHE’s Chief Medical Officer and Executive Director Dr. Larry Wolk told the Greeley Tribune that “we don’t see anything to be concerned with” in regard to oil and natural gas development and public health. There is also no indication in the paper that the researchers controlled for smoking. As maternal age increases, so do risks. That said, the study notes that in comparing siblings who were and were not exposed to fracking sites in utero, “exposed” siblings are almost always younger than the “unexposed,” indicating that the mothers in such instances were typically older at the time they had babies “exposed” to fracking. But new research based on Pennsylvania Department of Health data refute this narrative, actually showing that infant mortality rates have declined in the most heavily drilled counties in the Marcellus since shale development began — even surpassing the declines seen in the state as a whole, as the following chart from that report shows. Pennsylvania Department of Health data show that the six most heavily drilled Marcellus counties had greater infant mortality rate improvement than Pennsylvania as a whole from 2000 to 2014. This trend is even more notable, given the infant mortality rate in these six counties was higher than the overall Pennsylvania rate prior to the onset of shale development in 2000. By 2014, the infant mortality rate was lower in the six top Marcellus counties than for the state. In is also worth noting that Pennsylvania Department of Health data show low birth weight rates were at or below the state’s average rates at the same time fertility rates increased from 2000 to 2014 in Pennsylvania’s six most heavily-drilled counties. This is especially true with regard to the sample size of mothers living 1 km or closer to fracking sites, which are much smaller than the groups farther away from well sites, making them more susceptible to anomalies and outliers. As this graphic from the study shows, the bar graph to the far left indicates fewer than 1,000 births from mothers who live 1 km or closer to fracking sites were included in the study. Again, considering study spans 10 years, this is an extremely small sample size. Much like the aforementioned data — which at best, is inconsistent and at worst is flat out inaccurate — this small sample size issue further weakens the study’s topline conclusion. These positive caveats aren’t entirely surprising considering two of the study’s authors have made positive comments in the past regarding fracking’s health and economic benefits. Co-author Janet M. Currie, a Princeton University economics professor, also co-authored a study with Greenstone last year that found local communities have enjoyed “enormous benefits” from fracking. The study found average annual benefits of $1,200 to $1,900 per household for those who live near fracking sites, as well as a six percent increase in income and a six percent increase in housing prices. Greenstone’s prior statement that, “There’s a strong case that people in the U.S. are already leading longer lives as a consequence of the fracking revolution” is still valid. It also makes the bold declarations in this latest study more puzzling, especially given the flaws and contradictions in the data used to support such claims. Notably, data from groups like UNICEF have shown that widespread air pollution in developing countries is contributing to low birth weight and a myriad of other childhood health issues. But fortunately here in the U.S. – thanks largely to increased use of clean burning natural gas made possible by the shale revolution – we have the fewest air pollution-related deaths per capita in the world, and we are dramatically reducing emissions such as fine particulate matter that have been linked to birth defects and other serious health issues. We have achieved these reductions at the same time as we’ve emerged as the number one oil and natural gas producer in the world, helping to lift our economy out of the depths of the Great Recession to boot. If the questionable conclusions of studies such as this one are mainstreamed into the public consciousness even further, we stand to miss out on the substantial health and economic net benefits of fracking that these researchers have previously highlighted. NOTE: Information regarding a flaw regarding calculation errors, which still may be valid, has been moved pending additional review.